Decision: Should you play Miraculous Escape? Champions, Farstriders, and Cursebreakers should definitely consider Miraculous Escape for an easy score-immediately objective. Gitz and Nighthaunts also have solid enough defenses to consider it. Finally, Skaven, Reavers, Eyes, and Guard can mitigate the consequences of failure, and may wish to consider adding Escape into their decks - particularly if they are already playing ploys that support it. The rest of the warbands should probably stay away. The first question we have to ask about Miraculous Escape is whether or not it is worth playing at all. We only get 12 objective slots, and we need to be careful what we put in those slots. Fortunately, the release of the Banned and Restricted List has freed up some space in many objective decks thanks to the restriction of several "auto-include" objectives that were making their way into almost every deck. In particular, the B&R list hit on some very commonly played score-immediately objectives, and many players are finding it difficult to fill those slots. So, how can we evaluate whether Miraculous Escape fits the bill? First, we should note that it is only one glory. With the B&R list coming down hard on certain deck archetypes and powering up others, it's likely that we'll be seeing more multiple glory objectives in rounds one and two than we were before - especially from "hold-objective" type decks. Escape helps to make up for the low glory count by being score-immediately, so it can help fill the role of one of the four objectives from the restricted list that are also score-immediately. Finally, we need to evaluate how often we're likely to score this objective. It's not round-restricted (like Bold Advance, etc), and it doesn't require us to use an activation to score; those are both good. It does, however, require your opponent to do something specific- which is often a good reason to immediately relegate a card to the binder. In this case, though, the thing your opponent has to do is attack and miss, a situation that A) will happen and B) benefits you anyway. So despite it's shortcomings, Escape may just fill the void left in some decks by the B&R list. Which warbands in particular should be considering Miraculous Escape? Obviously warbands with high defense stats are more likely to be able to score this card than those with weaker defenses. All three Sigmarite armies should probably consider it, since they have the strongest overall defense in the game. Gitz and Nighthaunts should also look at it, as they almost all level up to 2-die defenses on inspiration. An inspired Sourtongue is a great model to score this objective with, as he's likely to be in the melee mix and has a fantastic defense stat. Those warbands that are stuck with single-die defenses will have a harder time scoring Escape, but in some cases may still want to consider it. Sepulchral Guard and Skaven, for example, have weaker defense stats, but recover easily from losing a model. Eyes of the Nine can benefit in this way as well, as long as the Blue Horror is the one that eats most of your opponent's attacks. Garrek's Reavers don't have the best stats for scoring Escape, but their inspire condition encourages them to play fast and loose with models - if you don't score Escape off a particular attack, you likely just got yourself one model closer to inspiration. Dwarves, Orks, and Fiends probably benefit the least from this card, as they will have to work hard to score it and suffer significantly from losing models. 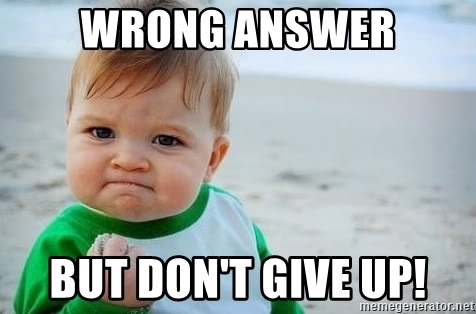 One factor that can definitely increase your chances of scoring Escape is support. Warbands that naturally want to stick together (Champions, Gitz) or those that can easily maneuver multiple models at once (Guard, Nighthaunts) have an advantage in this area. In general, each defensive support will increase your chance of successfully defending against a 3-sword attack by 4-6%. Against 3-hammer attacks, support matters even more, and in some cases *cough-Sourtongue-cough* a single supporting model can reduce your opponent's chance to hit by up to 9%. There are a few ploys and upgrades that can greatly improve your chance of scoring Miraculous Escape. Obviously, upgrades and ploys that increase your defense stat are useful in this area, as are those upgrades (Champion's Fortitude, Trusted Defender) that allow you to reroll defense dice. A word of caution, however: stacking a model with defensive upgrades may cause your opponent to ignore it in favor of softer targets. Similarly, playing a card like Ephemeral Shield may cause your opponent to have second thoughts about using that activation to attack. If telegraphing our intentions to over-defend can actually hurt our chances of scoring Escape, what are our other options? It's here that the very specific definition of a "failed" attack in the rules gives us some wiggle room. Knowing this, we can make use of some already common upgrades and a few less common ploys to score Escape. First, Tethered Spirit and Soultrap will both allow you to score this objective if they go off successfully. Essentially, upgrading with either of these can allow you two chances to score Escape off a single attack. Unfortunately both of these upgrades are on the restricted list. Similar effects do exist, however. Dwarves, Orks, and Reavers all get cards that allow a roll as a last ditch effort to save their model from a lethal attack. Similarly, there are a few universal cards that do the same thing but aren't restricted. On Your Feet mimics the effect of Soultrap, effectively allowing you a second chance to score Escape. However, it does require some clever positioning, so it may not be the best choice here. A more flexible option is Last Chance, which works particularly well for models with dodge-based defenses - granting them a 66.6% chance to avoid lethal damage. It's also worth noting that, according to the FAQ, Last Chance checks against your printed defense characteristic, ignoring situational modifier such as support and upgrades. Finally, one card that's likely to be overlooked in your quest to score Miraculous Escape is Rebound. While it's less reliable than the other options, its effect is more powerful. Besides the obvious benefit of damaging your opponent, it also doesn't require lethal damage to trigger. The downside is obviously that it only triggers 33.3% of the time - but if you're already running it (perhaps to score Masterstroke?) you might as well consider picking up Miraculous Escape as well. 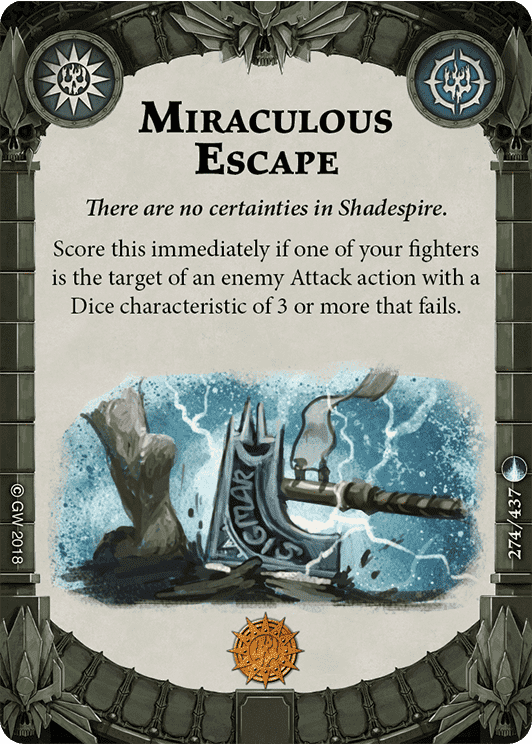 Finally, it's worth noting that Miraculous Escape will still trigger in the odd situation where your opponent fails to damage you with the attack, but then kills or harms your fighter with Pit Trap or Trap. The damage there is dealt by the ploy, and so the attack is still considered failed. We've chosen a good warband, kitted up our fighters with defensive upgrades, and filled our hand with ploys to save them should their defenses fail. That's all we can do, right? Perhaps the simplest thing that you can do to help you score Miraculous Escape is to put your models in a position to be attacked in the way you want them to be attacked. This gets tricky to quantify, as we are essentially trying to force our opponent to do something specific, so we won't go too deep into this topic. Put simply, though, you want to put the model that you are trying to score Escape with *cough-Sourtongue-cough* into a position to be attacked by the weakest possible attack that will still allow you to score. Doing so is going to be entirely situational, but there are some general guidelines we can follow. Note that some of these attacks have Cleave - if your defender is shield-based, you will want to avoid those. Finally, if a model has more than one attack, you want to incentivize your opponent to use the 3-sword attack (or 3 hammers, if you've got no other options) rather than a different attack. For example, against Farstriders, you might attempt to position your models in such a way that they could be easily shot with Boltstorm Pistol but not close enough to be attacked in melee. What if you can't dodge an attack to (literally) save your life? How about scoring a glory off it? There truly aren't many objectives that are comparable to Miraculous Escape - most score immediately objectives tend toward the aggressive side of the game. Thus, the only really comparable objective available at this time is Martyred. 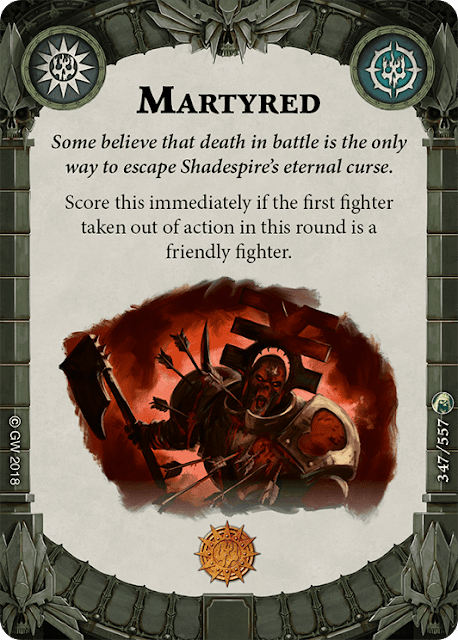 Like Escape, Martyred is score-immediately and is worth one glory. In some cases, it may present a better option than Escape. As mentioned above, Dwarves, Orks, and Magores will have a hard time scoring Escape; unfortunately, they'll probably also have a hard time scoring Martyred as their models are fairly tough and they tend toward aggressive play. Guard and Skaven may benefit from martyred, especially if they are planning to use their weaker models aggressively. With their high model count and relatively low damage attacks, Gitz and Nighthaunts might also consider Martyred. The Sigmarite armies probably benefit the least from Martyred and should definitely stick with Miraculous Escape. For high defense warbands and those that don't mind losing a model or two, Miraculous Escape presents a good option to fill the void of score-immediately objectives left by the B&R list. While it does require some dependence on your opponent's actions, the trigger is common and beneficial to pursue. Additionally, there are several solid ploys and upgrades that make it easier to score.